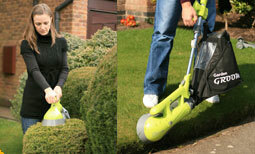 Manufactured with all the unique benefits of the Garden Groom range, Versa Trim is Garden Grooms unique multi purpose 3 in 1 tool, it trims hedges, lawns, grass, edges........ and collects. For information on operating the Versa Trim download one of our instruction manuals below. To view the pdf file you must have the Adobe reader installed on your computer. We now have a channel on YouTube. "The product is great and lives up to what you say. It grooms the hedge fantastically."